Was Saint Katherine Really Hypatia of Alexandria? The Archangel Michael Operated On Me! 1. A lady, who had never met St. Nektarios (†1920) while he was alive, related that her husband (who was not a particularly faithful or pious man) happened to kiss the right hand of the holy hierarch during the funeral procession when his body was being transferred from Athens to Aegina. To his amazement, he felt the Saint’s hand warm and soft, and ever since then he became a pious and faithful Christian. After hearing her husband’s account, she was saddened by the fact that she did not have the opportunity to venerate the body as well. That same night, the saint appeared to her. She found herself within a church. She noticed that His Eminence was standing before the Royal Gate, full of light and serving the Liturgy, while the faithful in the church cried out: “Nektarios became a saint!” She then cut through the crowd with her son, she approached the hierarch, received his blessing, and left full of joy. Shortly thereafter she visited the Monastery to venerate the grave of the recently deceased hierarch. When she saw a photograph of him, she was astonished at the resemblance because, as already mentioned above, she had never seen him when he was alive. 2. Five months after the repose of St. Nektarios, the nuns wanted to place an honorary marble top over his grave. The Abbess Xeni, however, was reluctant because in order to set the marble in place, the grave would have to be opened, and she feared that the remains may emit a foul odor, indicative of all corpses. She had not revealed these thoughts to any one else, when one night a certain nun saw St. Nektarios in a vision. “Which abbess?” inquired the sister. “Yes, you are completely intact,” agreed the nun. The nun informed Abbess Xeni of her vision. In following, the grave was opened and, indeed, the saint’s body was found incorrupt and completely intact. They witnessed that his head, his hands, and his feet were bendable. 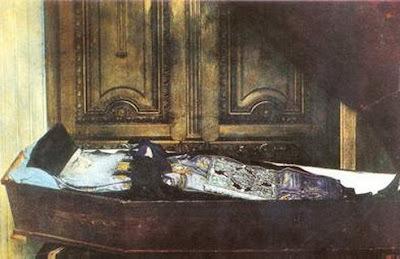 The entire body of the Saint appeared as a person who was asleep.